So November is officially upon us. That means that it is now time for men of all shapes and sizes to start sprouting those nose caterpillars once again to raise awareness for prostate cancer by taking part in Movember. Over the past few years, this annual event has grown rapidly, as more and more men transform from clean shaven to moustachioed, all for a noble cause. Due to the popularity of this event, many barbershops have found that an excellent marketing opportunity has arisen. In turn, Movember marketing has become quite a lucrative thing for many barbers and male grooming businesses. But why should the boys have all the fun! How about we find a way to include salons into this mix, with a little canny Movember marketing of your own. Here’s a fun one. 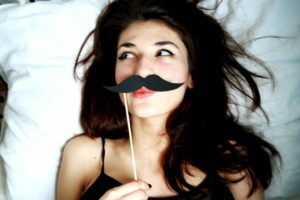 Create a whole Movember marketing campaign around the women who have to put up with their partner’s horrible crumb catchers for the month. Keep it light. Keep it funny. Theme it around the idea that they need pampering during this difficult time. Perhaps it’s a complimentary blow dry to women who have moustached partners. Or perhaps create a little moustache relief bag of goodies to give to clients. You could do a really cool social media Movember marketing campaign where you offer a prize to clients who send in photos of their very own Misstache (or Hair-tache). Even set it up so people can vote for the best picture (Based on Likes). This will help raise awareness for prostate cancer in its own right, while also bringing some more attention to your business as well! What usually happens when Movember ends? That’s right, all those hairy lip rugs come off. Why not try to capitalise on that moment? You could offer to shave the moustaches of your clients’ partners for free if they book an appointment at the end of the month. They can bring their partner in for the whisker removal, while they get a treatment. Pretty good, right? So what do you think? 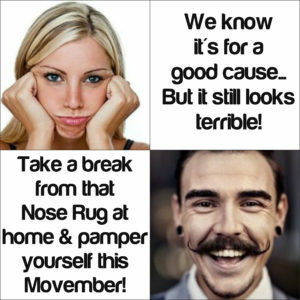 Any of these Movember marketing ideas sound good to you? If you have your own ideas on how to capitalise on this funky event, we’d love to hear it! If you are interested in maximising your Salon’s true potential, why not request a demo of our salon software today? Simply drop you info in the demo form below.